So after work today I pedaled out to Birkeland Bros., a Vancouver yarn/fibre shop at Main and 19th Ave. I’ve been gradually checking out all of the yarn shops in the city, as I come across them. 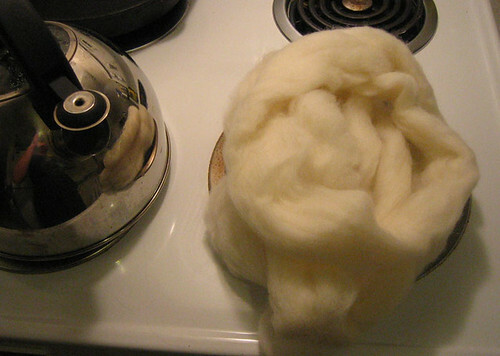 I didn’t have a lot of time, because it was late, but I picked up my very first spinnable fibre! 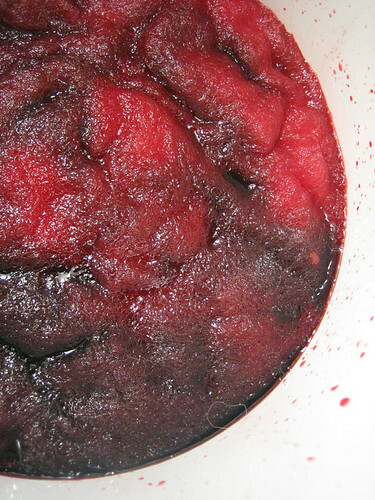 And what have I done with it, but immediately as soon as dinner was over, I pulled out the dye pot! Maybe you can tell from the excess use of exclamation marks that I am VERY excited to see what the result will be.